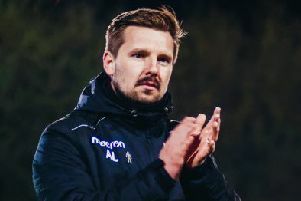 Harrogate Town made a string of defensive errors as they gifted Stockport County passage through to the quarter-finals of the FA Trophy in a 4-2 defeat. The game exploded into life after 18 minutes when Jack Emmett got down the right and into the away box where he delivered a dangerous cross that Jordan Keane couldn’t help but divert into his own net. That lead was to last just three minutes. Emmett initially did well to win the ball deep in his own territory, but then immediately gave it away again, allowing County to shift the play right where Darren Stephenson found Adam Thomas and the latter shot low across James Belshaw and inside the far post. Less than 60 seconds later, a Liam Kitching error afforded Stockport striker Frank Mulhern the opportunity to cut in from the right and run in on goal before he calmly slotted past Belshaw. The second period did not begin well for Weaver’s men as they once again shot themselves in the foot. Warren Burrell under-hit an attempted back-pass and Matty Warburton was able to stroll in on goal and roll into an empty net. Mulhern made it 4-1 after 79 minutes when he ran clean through on goal and rounded Belshaw before George Thomson pulled one back late on from Ryan Fallowfield’s cut back. With Guiseley and FC Halifax without a game on Saturday, Bradford PA also had a blank weekend after their National North match at home to Leamington was called off. Elsewhere on Saturday all the games involving our teams in the Evo-Stik League were called off due to the weather apart from Frickley Athletic’s game at Spalding United in the East Division. Philip Watt’s 90th-minute goal meant 13th-placed Athletic claimed all three points in a 1-0 win. All games in the Northern Counties East League were called off due to frozen pitches.